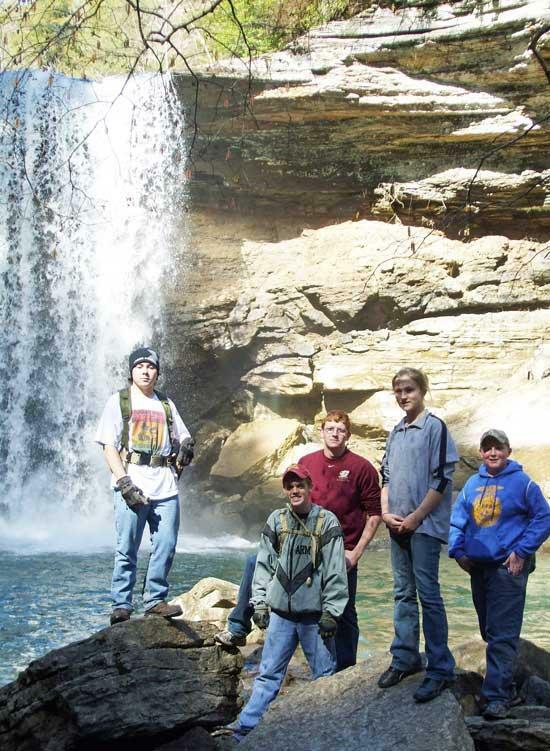 The Cannon County High School Outdoor Club traveled to the Savage Gulf State Natural Area Saturday (Feb. 26) and hiked six miles from the Stone Door overlook to Upper and Lower Greeter Falls. Savage Gulf is part of the South Cumberland Recreation Area near Grundy County. Savage Gulf is carved like a giant crows foot into the western edge of the Cumberland Plateau. Stone Door is giant crack in the bed rock that Indians used for centuries as a way to ascend from the gorge to the plateau. Savage Gulf is as wild and beatiful as it's name with spectacular overlooks and numerous waterfalls cascading down the canyons. Hikers included T.J. Paul, James Young, Charles Steeleman, Jamie Barber, Jason Taggart, Doug King and Marc Larson. For more information about our trips contact marcus.larson@ccstn.com. Great club! Hiking in the great outdoors is one of my favorite things and I'm so glad to see our Cannon county youth doing this. I wish they would have had this opportunity when I was in back in the 80's....Excellent club!